Seeing a lot of gardens in a few days or even on a one-day tour really highlights the importance of certain design elements. During a recent Garden Bloggers Fling in Austin, Texas, I saw texture everywhere. From smooth, hard metals to spiky plants to rivulets of rock or rustic bark, texture evoked a sense of place and style. It gave all of these stunning gardens contrast and made them more interesting to explore. The Lady Bird Johnson Wildflower Center outside of Austin is filled with texture both in plants and the hard surfaces. 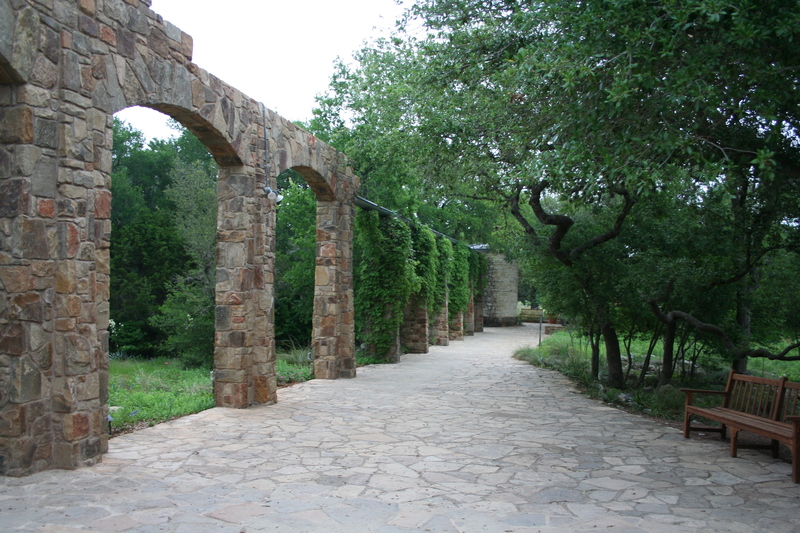 The limestone on the arched wall is native to Texas and used in many homes and public spaces. It’s softened by the trees and vines growing around it, and its colors are varied. Wouldn’t you love to sit on that bench and contemplate the stone and the garden? If you are ever near Austin, the wildflower center is a must-see. This contemporary garden used weathering steel (most commonly referred to as Cor-ten) for many of its walls and planters. The contrast between the soft ground covers and grasses, the sharp leaves of the yucca and the hard, rust-color of the steel, which doesn’t shine at all, is striking. Corten gives a sophisticated, industrial look to both large gardens, like this one, or smaller ones, like this Minneapolis potager, which bloggers toured in 2016. During a visit to the Zilker Botanical Gardens’ unique Hartman Prehistoric Garden, I spotted this large, deeply cut piece of stone in a wall. The prehistoric garden was created after amateur paleontologists discovered more than 100 dinosaur tracks on the grounds of the botanical gardens. The tracks were preserved and a garden with Cretaceus plants was developed, complete with a dinosaur sculpture that is popular with children. 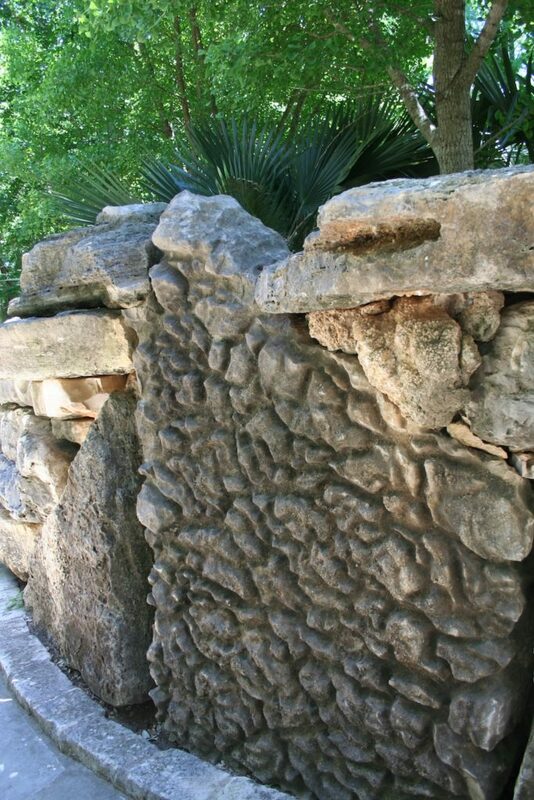 According to the Zilker website, plants in the garden represent those that existed 100 million years ago, including ferns, horsetails, conifers, ginkos and some of the first magnolias and palms. I’m not sure how old this rock is, but its fascinating texture indicates it has experienced plenty. With so much tan rock and green plants, many of the Texas gardens we saw added color with accessories. But accessories can also add texture. 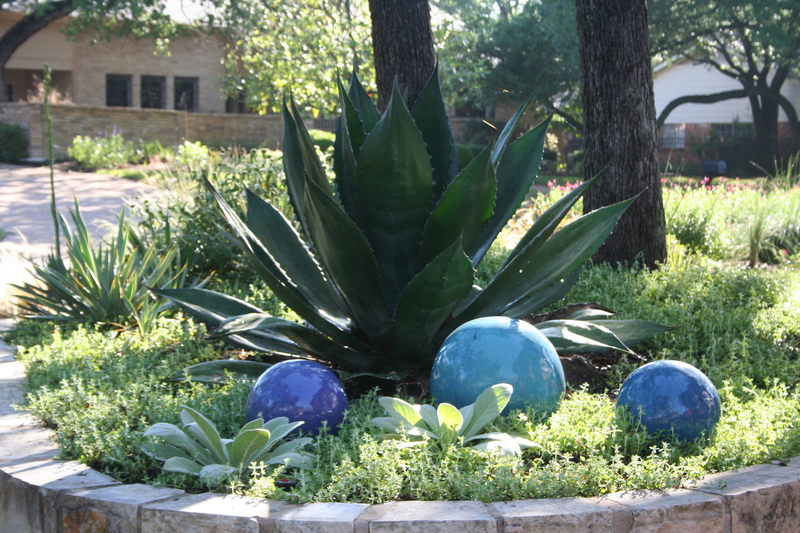 These smooth, shiny, bright blue orbs catch the eye, giving visitors a reason to slow down and notice the rest of this lovely front garden bed in the garden of Austin blogger Pam Penick. 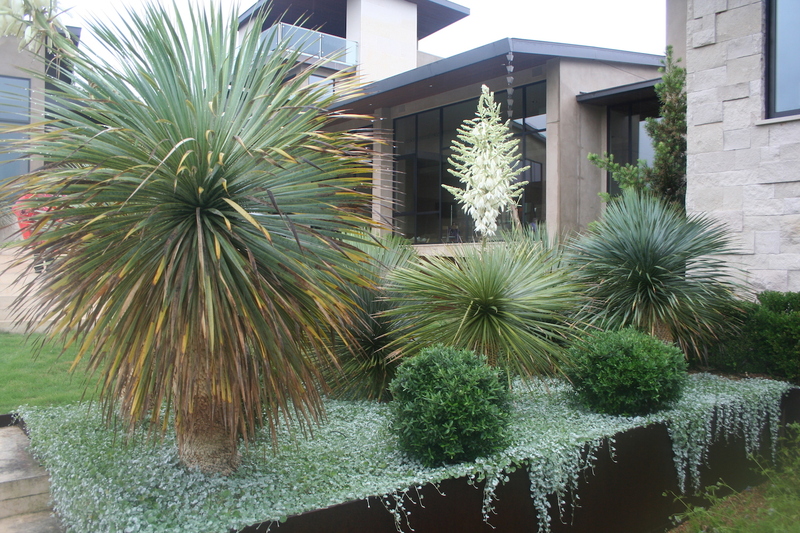 The soft texture of the lamb’s ears and ground cover contrasts with both the orbs and that big, pointy agave. Not all of these Texas textural elements would look appropriate in northern gardens but we have plenty of our own iconic textures, including the smooth stones so common around Lake Superior and the textures of the prairies that covered about a third of Minnesota at one time. 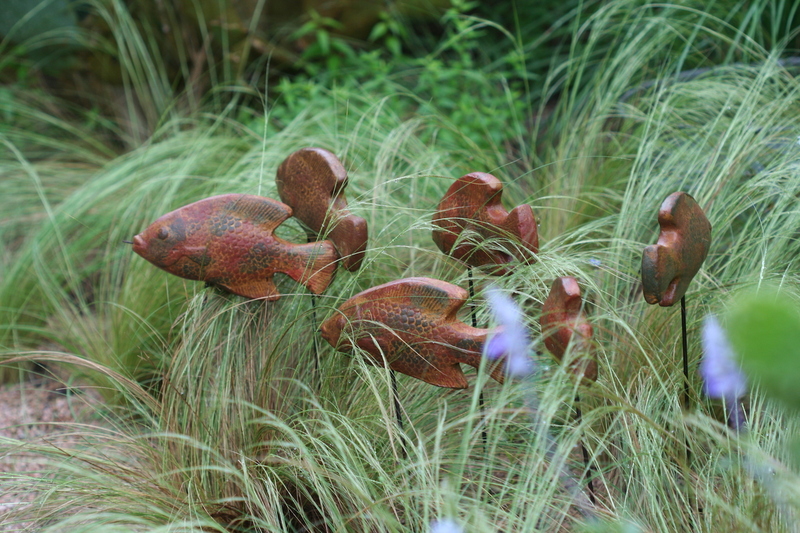 That’s one reason I loved these fish swimming through a sea of soft grass at the beautiful garden of blogger, Jenny Stocker. A native of England, Jenny has created a garden filled with smart details and varied plants in a series of garden rooms. It was a highlight of the tour, especially when Jenny showed us this recently hatched preying mantis. 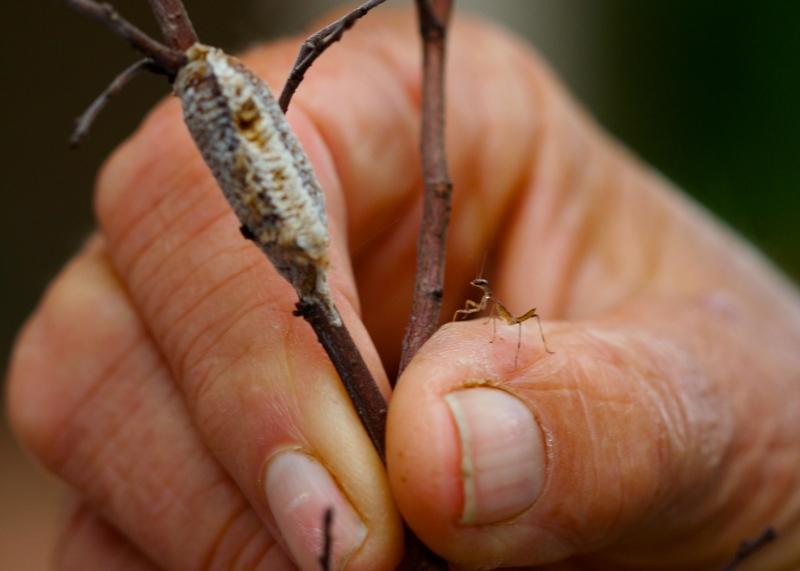 Jenny found this preying mantis nest on a branch and one of the babies posed nicely for all the bloggers’ cameras. What kinds of textures are you incorporating in your garden this year? « Will the Redbuds Bloom? I love seeing the commonalities of Austin gardens that you noticed, Mary. 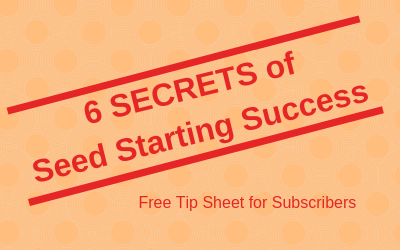 Thanks for posting — and thanks for coming! It was great fun to have you here. It was a great fling, Pam! Thanks to you and all the Austin planners. You saw those fish swimming among the feather grasses in my garden, Mary, not at the Natural Gardener. My walking/gardening buddy asked me this morning what my take-home was from Austin gardens at the Fling. You’ve nailed my response! Lovely visit through the fabulous Fling! Ooops! I have corrected the post. Your garden was a highlight of the fling, Jenny. Thanks for sharing it with us.